From The Greenpoint Grapevive: A(nother) Robbery On Nassau Avenue? I learned from a tipster this morning that another robbery has come to pass on Nassau Avenue this morning at 2:00 a.m.. 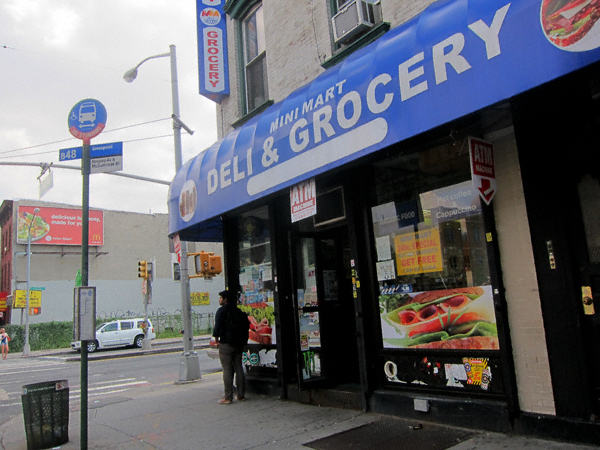 This time at the Mini Mart Deli & Grocery at the southeastern corner of McGuinness Boulevard and Nassau Avenue (as seen above). I decided to swing by and ask what happened. The very nice lady behind the counter confirmed that a robbery did indeed come to pass between “2:00 and 3:00 in the morning” and that two men were involved. No word about whether or not guns were involved. The most important thing is no one got hurt. Otherwise: YIKES!